The Positive and Negative Trait Thesaurus COVER REVEAL! TAKE CHARACTER CREATION TO A WHOLE NEW LEVEL! The Negative Trait Thesaurus sheds light on your character’s dark side. 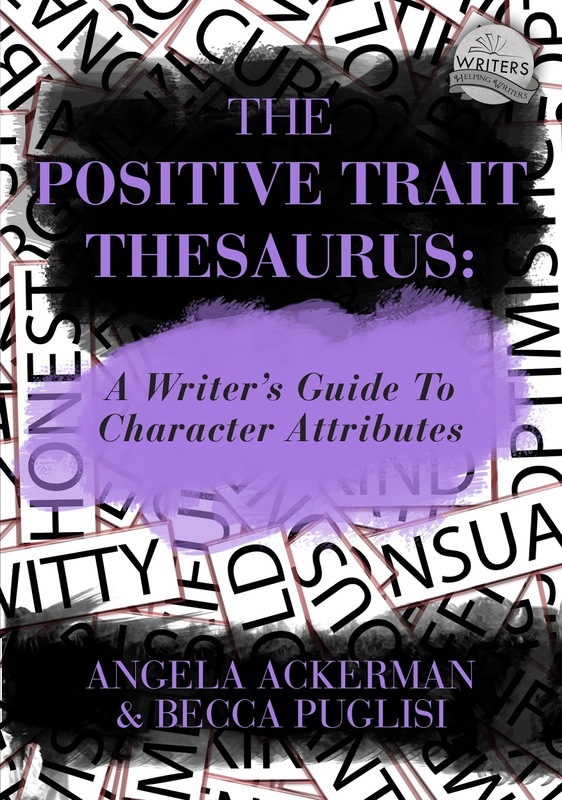 If you find character creation difficult or worry that your cast members all seem the same, The Positive Trait Thesaurus is brimming with ideas to help you develop one-of-a-kind, dynamic characters that readers will love. Oh my gosh, we are SO excited about these books, you have no idea. When Angela and I start a new thesaurus, it almost always comes from a place of personal struggle: Where do we have problems in our own writing? Is this a problem that other writers have? What kind of resource might help us all in that area? Characterization is hard to get right, so we knew we wanted to tackle that one at some point. Then we started writing the Character Traits Thesaurus entries on our blog. We knew we’d stumbled onto something good when so many of you started telling us how useful they were. So we’ve expanded our original thesaurus, providing more content for each entry, plus adding a bunch more traits—so many that we had to split the resource into two manageable books. And we are so excited to release them upon the writing world! And when is the big day? you may wonder. Well, wonder no more. Our newest books will be available for purchase October 21st! And, you know, we can’t celebrate without some kind of spectacle—one that will involve lots of cool giveaways, encouragement for writers, and general shenanigans within the community. But, my goodness, I can’t spill the beans on that just yet. We’ll save that for another post ;). So thanks again, to everyone who has encouraged us, supported our work, and sent happy messages regarding your experiences with The Emotion Thesaurus. Without all of you, these books would still be sidebar links, a mere portion of their full potential. More good news to come. Can’t wait to share it with you all! This entry was posted in About Us, Positive & Negative Thesaurus Guides, Uncategorized. Bookmark the permalink. 53 Responses to The Positive and Negative Trait Thesaurus COVER REVEAL! Melissa, i’m sorry; I just realized that we haven’t answered your question about The Emotion Thesaurus. Yes, the final list of entries in the book is different from the list of emotions that we covered on the blog. When it came time to publish, we went back and forth trying to figure out exactly what was an emotion and what wasn’t. Some of them we cut and some we combined; if there’s one you’re missing, that’s probably why. That being said, we are keeping a list of emotions that should make the cut should we ever decide to release a second edition, and contentment is definitely on the list. Thanks for mentioning it! How about your fans in Africa? i remember having some difficulty getting the Emotion thesaurus in my country. Would we be able to get it as quickly as people from other countries? These look great. Where will they be for sale at? On the website? Thanks all of you! And Melissa, no worries on typos! I am the typo queen when it comes to posts, lol. We really hope these books help you all on your writing journey. I struggle with characterization and I know they will help me, haha. Huzzah! I can’t wait for these books! So glad October is just around the corner. 😀 Congrats!!! Holy Buckets is right! I am super excited and can’t wait to get my hands on both of these gems. I can’t tell you how often I refer to my emotional thesaurus when I am writing. I originally purchased the Kindle version, which is great, but then I also bought the hard (soft) copy as well. It’s one of those rare writer’s craft or “writer’s help” books that I can’t live or write without. I usually have my Kindle opened on my laptop (to the Emotional Thesaurus) along side Scrivener, when I work on my manuscript. Yippie, Yea! I can’t wait. It comes out on my little boy’s birthday, so I will have to buy myself two presents on his b-day. I have a question. Did you leave out any of the original emotional thesaurus entries when you published the book? The reason I am asking is because I am working on revisions and I was reading a scene that I wrote quite a long time ago and in the margin I have a note to self that says something like, “see emotional thesaurus for better internal sensation.” I can’t remember the exact emotion right now, but I think it might have been contentment (not certain). Anyway, it seems like the book actually covers more emotions than the blog or at least as many. I was wondering if you combined any of them when you wrote and published the book. A very big. congratulations to both of you. Your blog and books are a great source of knowledge and inspiration for me. I really can’t wait. And two books coming out at the same time. Way to go! Your readers are in for a nice treat, come October 21st. I apologize in advance to everyone for any typos in this comment. My son’s lab puppy chewed several of the keyboard letters off my laptop and I’m having to guess where some of the letters should be. Sorry. I’m so excited for this. I love the Emotional Thesaurus and it has been my go to book in my writing journey. So stoked to purchase both of them. I have The Emotion Thesaurus and I use it daily. Thanks y’all so much for putting out two more books!! Congrats! 😀 The covers look amazing! I am definitely going to buy these as soon as the release date comes around. Angela and Becca, I cannot wait to buy both books. I keep the emotion thesaurus on my desk and use it nearly every day. I’ll be buying these new books, too. Thanks for putting them into book format! @Victoria, the PDF will be available at Gumroad (Gumroad.com), like The Emotion Thesaurus currently is. We’re hoping everything will be available worldwide on 10/21, but sometimes it takes longer for the books to become available overseas. Fingers crossed :). ooo, I’m so excited too! CONGRATS! I look forward to getting both of these books. They will be great additions to writer’s bookshelves. Will they be available in the UK on the same date? If not, will they be available as a PDF on the website? Can’t wait to get my hands of these!!!! If they’re anything like ET, they’re going to be awesome!!!! Congratulations to both of you! So excited for you. 🙂 Can’t wait to buy these! Congrats! Just added both to my Goodreads TBR list. LOVE this series! You two have helped so many of us improve our writing. Thanks for all the hard work you’ve put into these books. Congrats! It’s so exciting that they’re almost here! How cool! They look fantastic! Yay! I’m feeling the love :). Thanks for the well wishes, everyone! Aw you guys are the BEST. Thank you all for your excitement! Are you planning on doing one for settings? I am a fan, you guys are awesome!! I own the emotion thesaurus. I’ll be sure to grab these. Whoo hoo!! Congrats! I can’t wait to add them to my BOOKSHELF MUSE collection!! 🙂 So happy for you both! So excited for you guys… This is great news! 🙂 I know how hard you must have been working on these! The covers are awesome–love how the three of them go together! Woohoo! (Also a little excited for me, too. Can’t wait to get them! *grabby hands*) CONGRATULATIONS! They look and sound terrific! Congrats on all your hard work!!!! Great news!!! Congratulations to you both on the upcoming release. I can’t wait to get my hands on these. WooHoo!! congrats. looking forward to them. I can’t wait for these. I keep “The Emotion Thesaurus” on my desktop at all times! It is my go to book! And your website is always open when I write. I consult it all the time. I love it. I’m going to be first in line for your new books. Oh wow you guys! I have tears in my eyes seeing all this support! These books will greatly help writers brainstorm their characters and better understand how their troubled pasts lead to present behavior, and we are so excited to be finally able to have a release date to share them with you all. You are the best! Thanks for the kind words! I will own it all! Thank you for doing this to help all of us! Congratulations ladies! These sound like such great resources that I think they were probably worth at least a few gray hairs (I’m sure there are only a few)! Congratulations, you two! I’ve been cheering from the sidelines and loving how this blog has blossomed. Really beautiful to watch, and it’s a great gift to writers. Brava!!! That’s such great news, ladies. Your Emotion Thesaurus has really helped to springboard ideas for me. Looking forward to this. You ladies are amazing so of course your new books will be! Congrats! Love the covers. And so excited for you!